This is a 10-pack of wires that are pre-terminated with an alligator clip on one end and a hookup pigtail on the other. Alligator clips are a staple item for any workbench or makerspace, and with these cables you will be able to easily incorporate those clips into a breadboard, development platform or anything else to which you would normally be able to attach a hookup wire. Each alligator clip with pigtail cable has a wire length of 30cm (that's a little less than 1ft) and a male pin that easily inserts into a standard 0.1" connector. 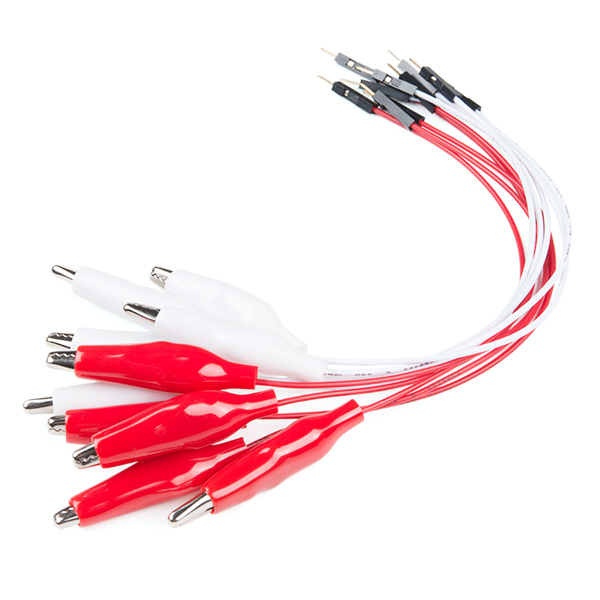 Each pack consists of five red cables and five white cables. Well made. Good to have handy for prototyping/testing. I needed to test a design that involved combining multi-strand cable wires with solid strand digital wires on a bread board. The slick little cables allowed me to test and confirm my design without resorting to soldering header pins into a perforated board. Only downside was that the plastic cover on the alligator clip was a little too large and it would rotate and slip while trying to open the clip.